Total pad care in less time! The Wolfgang Pad Werks Cleaner & Extender Combo combines - Wolfgang's one-step total pad care solution, Wolfgang Pad Werks Cleaner & Extender - with the essential Pad Conditioning Brush to make pad care easy. 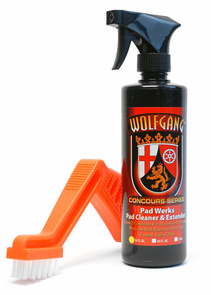 Wolfgang Pad Werks Pad Cleaner & Extender is an extraordinary total pad care solution. This easy-to-use formula cleans and conditions polishing pads with each application. Powerful emulsifiers release stubborn residues from the pad while unique conditioning agents preserve the pad for future use. In one easy step your polishing pads will be cleaned, conditioned, and preserved for the next use. Apply Wolfgang Pad Werks Pad Cleaner & Extender to the face of the polishing pad. Allow the advanced formula to penetrate for 45 seconds. Agitate clean with the Pad Conditioning Brush. Massage pad to work the cleaner deep into the pad's surface. Flush residue completely out of the pad using running water or a bucket. Wring pad to remove excess water and allow to dry face down. A total retail value of $28.98. You save $5.99!